This year as part of the Over 50s Show held in the Royal Dublin Society, the first Irish genealogy and family/social history experience, called ‘Back To Our Past’ was held on Friday 15th, Saturday 16th and Sunday 17th October 2010. The exhibitors included The National Library of Ireland, the National Archives of Ireland and Public Record Office of Northern Ireland, as well as many genealogy societies in Ireland. Many UK genealogy groups also had stands. 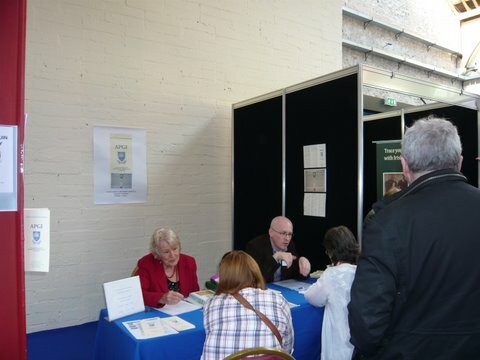 Members of the Association of Professional Genealogists in Ireland were present for both Saturday and Sunday providing a free genealogy advisory service to the public. 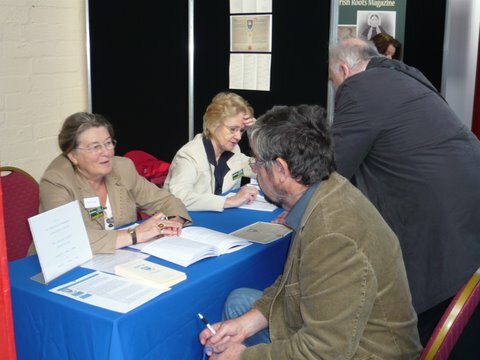 The stand was kept very busy each day with many queries from both novice and experienced family history researchers. APGI member, Eileen Ó Dúill was one of the many speakers who gave lectures over the weekend. Her talk was on the civil records of the General Register Office and was well received. Due to the success and the huge crowds that attended each day, the whole event of ‘Back To Our Past’ is to be held again in 2011 on a larger scale. 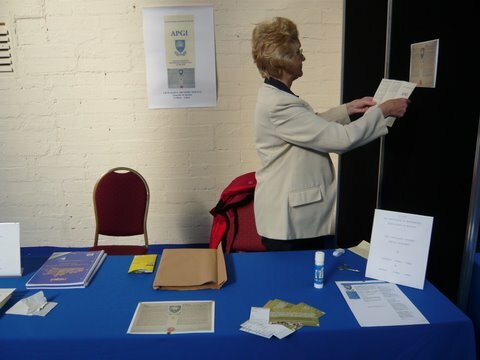 APGI table at Back to our Past, RDS 16 Oct. 2010. Maire & Joan at APGI stand. The Association of Professional Genealogists, the largest organization of professional genealogists in the world, has announced the results of its election of board members. Eileen O’Duill, CG, M, has been elected for a third term to represent Britain and Ireland on the board. Eileen specializes in international probate research and has lectured at national conferences in the United States and in Ireland. She is the chair of the International Committee of APG and with her fellow committee members, has facilitated the presence of APG at the “Who Do You Think You Are? Exhibition in London next February. APG members from Britain, Ireland and Europe will be meeting members travelling from the US and Canada at the first APG meeting outside of North America. Details of the election are a\vailable via this link. The Council of the Irish Genealogical Research Society (IGRS) (www.igrsoc.org) at its meeting held on Saturday October 10th in London unanimously elected member Steven Smyrl Chairman of the Society. The online 3rd edition of the Directory of Graveyards in the Dublin Area, published by Dublin City Library and Archive and edited by APGI member John Grenham, is now available at www.dublinheritage.ie/graveyards. Gerry Kennedy has recently become a full member of the Association. On Saturday 2nd October 2010, APGI Member Steven Smyrl will be speaking on Dublin’s Protestant Dissenters, their meetinghouses and records at 10.30 a.m. in Dublin City Library & Archive, Pearse St., Dublin 2. Full day Seminar 10am – 5pm. Open to non members. All Welcome. Admission free. (No booking required) For full details see www.ifhs.ie. On Wednesday, 20th October 2010, APGI member, Rosaleen Underwood, will be giving a talk to the Ailbrin Society on “Irish Merchant Princes, Fathers of Banking in Ireland”. Venue : The Red Store, North Main Street, Youghal, Co. Cork at 8.30pm. APGI member Eileen Ó Dúill, CG, will be speaking at the Irish Cultural Centre of New England’s 20th Annual Irish Festival in Canton Massachusetts on “Irish Civil Records: births, deaths and marriages”. This 3 day festival runs from Friday the 17th of September to Sunday the 19th. Genealogical advice will be available at the TIARA- The Irish American Research Association marquee all weekend long. More information on the programme is available athttp://www.irishculture.org/IrishCulturalCentre/Irish-Festival.aspx. On Thursday 9th September, member Rosaleen Underwood will be speaking about ‘Sources for Irish Merchant Banking Families’ at a seminar in the National Library called “Everybody’s Business : Irish Commercial Life – History and Sources” presented by the Library Association of Ireland Genealogy and Local Studies Section in association with the National Library of Ireland. APGI member Joan Sharkey is to give a lecture at a seminar run by the Western Family History Society in Co. Galway. The seminar takes places on Saturday 4 September from 2pm to 6pm in the Claregalway Hotel, Claregalway, a few kilometres outside Galway City. The theme of the seminar is ‘Irish Genealogy 2010’. Joan is giving another lecture at 6.30pm on Wed. 25 August in Raheny Library, Howth Road, Raheny as part of Heritage Week. The lecture is called ‘Raheny Footprints’ based on the Raheny Heritage Society’s publication of the same name published in 2009. The book gives details of 20 distinguished people who lived at various time in Raheny. More details are available here. Susan Chadwick, Nicola Morris and Robert Somerville-Woodward have all recently become full members of the Association. As part of the Cork Lifelong Learning Festival 2010, on Tuesday 23rd March from 11am to 2pm at the Cork City and County Archives in Great William O’Brien Street, APGI member Rosaleen Underwood will give a talk and workshop entitled ‘Learn About Who You Are’ with an emphasis on new developments in genealogy and websites. There will be individual consulations afterwards. APGI member Steven Smyrl is giving a paper to the Clare Roots Society at 8pm on Thursday, March 18th in the Ennis Civic Rooms. The paper will look at court records in Ireland and what survived the conflagration of 1922. Particular reference will be given to surviving material for Co. Clare. One of the biggest genealogical gatherings in the world this year will be Who Do You Think You Are? Live at the National Hall, Olympia, in London on 26-28 February. The event has hundreds of exhibition stands representing family history societies, record repositories and commercial organisations. In addition, there are lectures, workshops and appearances from celebrities featured on the Who Do You Think You Are? television series. Two APGI members, Helen Kelly and Paul Gorry, will be present, giving advice on Irish research. Tourism Ireland is one of the event’s sponsors on this occasion. Helen Kelly, ’s President, will be at the Tourism Ireland stand over the entire weekend. Three of Ireland’s record repositories will also have stands. The National Archives, the National Library of Ireland and the Public Record Office of Northern Ireland (PRONI) will, as in former years, be on hand to advise about their holdings. Paul Gorry of APGI will be on the National Archives stand along with Senior Archivists, Catriona Crowe and Aideen Ireland. Paul will also present a talk, ‘Irish Genealogy Meets the Twenty-First Century!’ in the Society of Genealogists Regional Workshop at 11am on the Sunday. The third Diploma in Family History course at Independent Colleges, Dublin, begins on Tuesday 9 February and it will conclude on 4 May. It is run by Independent Colleges in conjunction with APGI . The first such course began in February 2009 and the second in October. Lectures take place at Independent Colleges’ premises in Dawson Street in the centre of Dublin. Introductory visits to the National Library, the National Archives and Dublin City Library & Archive are built into the twelve week programme. While students will attend evening classes for three hours once a week, the emphasis is on learning through practical application between classes. Students must complete two assignments. This months talk to Clare Roots Society takes on the tricky subject of adoption and takes place at the Ennis Civic Rooms on Thursday, Feb 18th at 8pm. Fiona Fitzimons will take participants through obtaining records for Irish children who were fostered prior to the Adoption Act in 1952. Prior to the introduction of the 1952 act, fostering in legal terms, applied to all ‘adoptions’ arrangements in Ireland in which a child would be permanently raised by people other than the child’s own birth parents. In practical terms, there were two main types of fostering. Informal fostering was usually organised within the extended family network when parents could not rear the child because of personal circumstances. For the family historian, these arrangements can be very difficult to trace. This type of ‘informal fostering’ arrangement is beyond the scope of this paper, and will not be considered during this talk. Fiona will explain the type of records that will contain relevant information on ‘boarded out’ or ‘fostered’ children prior to the introduction of the 1952 Act. Also, how the current legislation affects the rights of those seeking their natural families to access these records.